Zach Eflin returned to the mound for Lehigh Valley. Brandon Leibrandt pitched well in his start for Reading. Drew Stankiewicz figured in all four of Clearwater’s runs. And, Lakewood lost in 15 innings. The Extended Spring Training games have started. The roster is attached below. Lehigh Valley (3-3) shutout Scranton 6-0. Zach Eflin came off the DL to pitch 5.0 shutout innings. He allowed 5 hits and walked 3 while striking out 4 batters. Pat Venditte and Hoby Milner combined to complete the shutout. Eflin threw 70 pitches. Roman Quinn (3), Jorge Alfaro (3), and Dylan Cozens (2) had multi-hit games. Cozens had 2 RBI. Quinn stole his first base and recorded an outfield assist. Reading (2-3) beat New Hampshire 10-5. Brandon Leibrandt made his first start and allowed just 2 unearned runs on 3 hits and a walk. He struck out 3 and picked 2 runners off base. Tom Windle followed and had his second bad outing in as many appearances. Yacksel Rios struck out 4 in 2.1 perfect innings. And Miguel Nunez finished up with a one-walk inning. The Phils put up crooked numbers in four innings. All starters except Malquin Canelo had at least one hit. Harold Martinez (4), Carlos Tocci (3), Scott Kingery (2), Andrew Pullin (2), Jiandido Tromp (2), and Joel Fisher (2) had multi-hit games. Every starter had at least one RBI except Canelo and Fisher. Kingery, Pullin, and Angelo Mora hit home runs. Clearwater (4-2) came back to beat Lakewood 4-2. Blake Quinn made his first professional start and pitched into the fifth inning. His 4.2 innings were his longest appearance, surpassing a 4.0 inning relief stint in his last appearance with Williamsport last season. Quinn threw a career high 76 pitches, 54 for strikes. His line was 4.2 IP, 6 H, 2 R, 1 ER, 0 BB, 4 K, HBP, WP. The unearned run moved into scoring position on the first of two passed balls by catcher Deivi Grullon. Austin Davis struck out 3 in 2.1 innings. He gave up 2 hits and a walk. Tyler Gilbert pitched a one-hit eighth. Jacob Waguespack pitched a perfect ninth for his first save. Quinn and Davis each had to pitch around balk calls by the base umpire. Drew Stankiewicz provided the key hit in a 3-run seventh inning that put the Threshers into the lead. Stankiewicz had scored the Threshers first run in the fifth inning. He lead off the inning with a double down the right field line. He eventually scored on Zach Coppola’s infield single. In the seventh, he came to the plate with runners on second an third and the Threshers facing a one run deficit. Stankiewicz lined another double down the right field line to take the lead. He scored the final run on “C” Randolph’s line drive single to left field. Coppola, Randolph, and Stankiewicz each had two hits. Jose Pujols had another rough night. He is now 0-14 in his last 3 games with 11 strike outs. Quinn’s FB sat 90-92, T93 mph. 60 of his 76 pitches were FB. Austin Davis’ FB was 92-93 mph. Lakewood (4-2) lost to Hagerstown in 15 innings, 4-3. Bailey Falter threw 5.0 one-run innings. He allowed 5 hits and struck out two. Felix Paulino gave up 2 runs in 3.0 innings of relief and blew the save. Will Hibbs chipped in with 2.0 no-hit innings. Trevor Bettencourt struck out 5 in 3.0 shutout innings. Harold Arauz gave up the winning run. Daniel Brito (3), Cord Sandberg (2), and Edgar Cabral (2) had multi-hit games. All ten of the ‘Claws hits were singles. There are 69 players listed on the Phillies’ 2017 Extended Spring Training Roster – 39 pitchers, 6 catchers, 15 infielders, 9 outfielders. Some surprising yet familiar names are included – Victor Arano, Joe Denato, Grant Dyer, Elniery Garcia, Mario Hollands, John Richy, Zach Green. In one game today, Mark Laird started in center field. I only stayed for a few innings. Kyle Young started for Pat Borders’ team. He pitched 2.0 scoreless innings. He gave up 3 hits and walked a batter, but struck out two. The hits were soft contact. A couple were shallow bloops over the infield. In any event, he loaded the bases in the first and pitched out of the trouble. Casey Brown pitched the next two innings. He allowed one base runner and struck out three. I overheard the guys on the radar gun. He was throwing 92 mph. Laird went 1-2 while I was there. He and Raul Rivas who also singled, scored on Cole Stobbe’s 2-run single. Stobbe scored on Jhailyn Ortiz’ double into the right center field gap. Enmanuel Garcia went 2-2 before I left. At that time the Phillies had a 3-0 lead over the Yankees. Here’s video of Stobbe’s 2-run single and Josh Stephen’s first AB. 4/11 – LHP Bailey Falter assigned to Lakewood BlueClaws from Williamsport Crosscutters. 4/11 – RHP Ismael Cabrera assigned to Williamsport Crosscutters from Lakewood BlueClaws. 4/11 – Phillies optioned RHP Zach Eflin to Lehigh Valley IronPigs. 4/11 – LHP Wander Perez assigned to Phillies Ext. Spring Training from Lehigh Valley IronPigs. Jim what kind of breaking pitches do Quinn and Davis have ? Kingery showing some if that new power . I guess Mickey Mo took a night off, Pujols and Jp seem to have an allgeric reaction to hitting a baseball. Davis throws a FB, CH, and SL. I’ll have to get back to you on Quinn. Ty Jim I know Davis is a big lefty ,Quinn had a nice bp yr .
Alfaro has the same number of hits this season as Crawford, Cozens and Williams combined. Both Rupp and Knapp can hear his footsteps. Alfaro and Valentin are 2nd and 4th in hitting in their league. Wow it is way too early to start looking at that. K’s and BB’s aren’t too far off from being meaningful. Sadly you know who’s not hearing footsteps? Galvis or Saunders. Brito is a hit machine. My Breakout player, Randolph, doing some things. Hopefully Cord Sandberg keeps hitting enough to move up and get out of the way of Jhailyn Ortiz. Hey Jimmy has there been any update on Grant Dyer? Nothing official. I believe that if he’s in XST, he must have suffered some sort of nagging injury that they want to monitor closely. The SO’s are mounting for JP I’m curious how many of those are looking vs. swing and miss. I don’t know the number, but he’s taken a surprisingly large number looking. At least surprising to me. It’s nice that Effin lines up with Buckholtz. Pullin should be in our top 30. 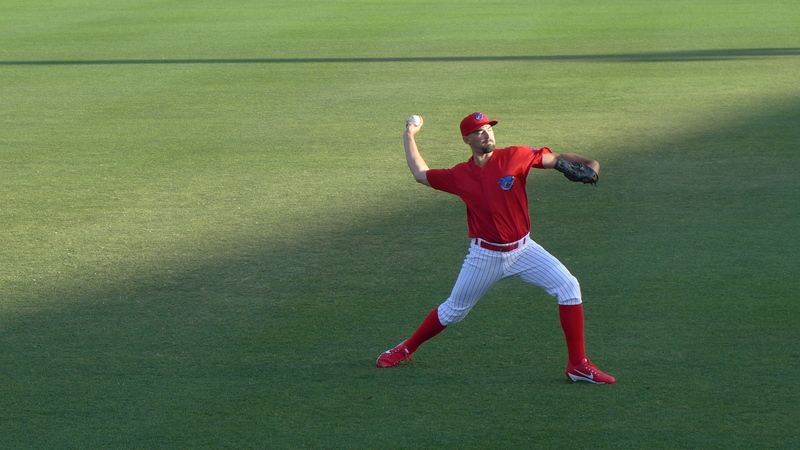 Jose Pujols has two obvious plus tools….his power and his arm. But at this rate, his high swing and miss will have him repeating high A again if this continues thru the season. Maybe Joe Jordan and the crew will give him a shot on the mound come FIL. Quinn and Alfaro continuing to show they’re ready. The Extended roster is so big already and then you realize that another draft class will be added on before setting the two short season rosters. Lots of guys will be cut at some point in the process. Hopefully a few will move up as a result of trades at the top but that’s months away. If Quinn plays like he’s playing now, which I expect he will, into May, decisions will have to be made. If he stays healthy, the kid is too good and too valuable to be at LHV. And we also know this fact…the two DSL teams will be loaded with newbies. They signed 61 this period ..the most of any MLB club. I think that a bunch of those guys are already on the XST roster here, Brayan Gonzalez, Francisco Morales, Juan Aparicio, Nicolas Torres, Simon Muzziotti, Jose Tortelero, Christian Valerio, etc. I can think of maybe 13 more guys that are probably listed on this report that aren’t currently represented on a roster – but it’s nothing close to 61 more players. calvin….as yuo said, all the players you just mentioned are all part of the J2, 2016 thru June15, 2017 period signings. Now some of them may be going to the GCL, like Muzziotti or maybe even Morales. I guess it will all depend on their development levels right now and how fast the Phillies want to see them get challenged. But 61 is practically doubled their normal international signings..
Rhys is so damn consistent…he rolls out of bed and gets on base. I have never understood the Tommy Joseph love. Rhys is 10x the prospect of Joseph. I want him up by mid season. Tommy is a great personal story that he made it last year but I think Rhys is going to prove to be a far better player sooner rather than later. Should we assume that they’ve been released? Also sort of wondering why Gregori Rivero, Tommy Bergjans, Mark Laird don’t appear on this roster since they’re not officially on the Clearwater roster. What team has Darick Hall been assigned to? Didn’t see him on the extended spring training listing and don’t see him on any of the minor league rosters. I think I read from Jim that he’s going to be a mid-seasoner at Williamsport. This surprised me, as he is a college kid that seemed to impress this spring. Hall was hurt. When he’s feeling better he will play at Lakewood. They currently have three guys they’re trying to work in at 1b so they’re playing with the roster to do it. Kingery just went yard, 3 run shot at Tromp and Canelo both walked. meant to say as Tromp/Canelo walked. Pullin next up and crushes a double. Holy crap… is kingery ready for Triple A to join his future double play partner and other future teammates, or do you let him continue to destroy double A? I think they give him another month, month and a half and then bring up valentin and move kingery to Lehigh. Would be so nice to have JP, kingery, Alfaro, Hoskins, Cozens, Quinn, Williams all together in one lineup! Let him have a little sustained success in AA before getting carried away. This is the minors, you have to let him stay at AA for at least 2 months. If he rips AA pitching, so be it. Pullin sure does have a nice swing. Hits his 6th double of the season. Clay Buchholz getting an MRI today on his forearm…. hmmm.mmmm phantom injury already??? Charlie Morton would look great in a Phillies uniform instead of Clay Bucholtz. What a mistake made by McKlentak this season. philabalt…..if 2017 Phillies wins are what you want, yes that was a mistake. If tanking is what interests you for a better chance at the best Beer in South Carolina, well then it was a well thought out strategy on their part and still may unfold.. If it was for July 2017 trade chip value….would seem to make no difference….neither< IMO, would be in such demand by contenders that would ultimately bring back much in return. Keith Law released his updated top 50 players. Seems pretty fair. Will be interested to see if we have anyone who will make the 51-100 list. I doubt Nick Williams will be on it. He has not looked favorably on him as a top prospect for the last two years. I think both should be, but not sure if they will. I follow Law a good bit, and he doesn’t seems to have much love for the Phillies system in terms of impact players. However, he does attribute this to injuries (Appel) and under performers (Williams). Law, though smug and arrogant, does know scouting very well. Since he lives in Wilmington, he has ample opportunity when he is in the area, to see Phillies prospects, along with all the MLB clubs affiliates playing in the EL and SALLY. Smug + arrogant + incompetent = Amaro Jr. Rankings are purely subjective and I don’t necessary agree with keith Law’s methodology in ranking prospects. He better be good in what he’s doing to avoid the Amaro Jr. line. Klaw lives in Wilmington I should get some of my friends to egg his house ! Keith Law values “wow” factor — most likely Sixto will make his Top 100 list. Kilome didn’t created a buzz so i can see him missing the cut off. Anybody know what happened to Gamboa? He left last night’s game and didn’t play tonight. Also, Lucas Williams really struggling. I wonder how long they go with him before swapping him and Stobbe. Interesting that Brito is getting time at SS. I’m sure it’s temporary.